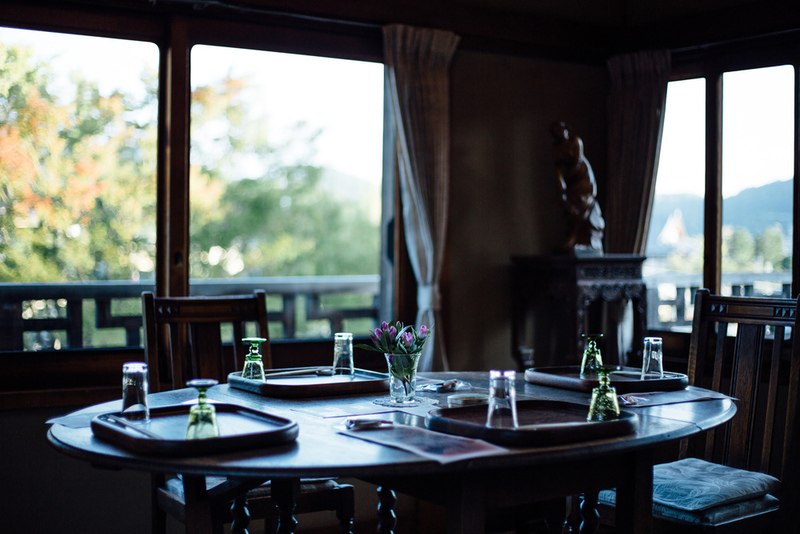 While adding modern comforts, we have worked hard to preserve this historic house in its original style, so that guests can comfortably enjoy Yoshida-Sanso and all of its unique features. The house is designed to present a magnificent view of Mt. Daimonji and the entire range of Kyoto's eastern mountains: upstairs, each room has a view of the mountains, downstairs, a view of the garden. Kotobuki is an elegant room that enjoys a lovely view of the ryokan garden with its flowering cherry tree. Fuku is a very bright corner room that commands a fine view of both the Higashiyama mountains and the ryokan garden below. You can choose the course from the 18,630jpy, 24,840jpy, 31,050jpy, 37,260jpy ~ / per person. Please advise us in advance if you are Allergic to certain foods(ex. Fish, Meat, Crustacean...) or your dislikes/preferences. The rate mentioned above include Tax, Service Charge & Accomodation tax for the room. When bathing you have complete privacy in a gorgeous tile bath. Note that in traditional Japanese ryokan inn style, the bath is not ensuite with the room. The Hanare was built in the sukiya style of traditional Japanese architecture, constructed entirely of Kitayama sugi (a highly prized Japanese cedar from northern Kyoto). This refined dwelling abounds with the atmosphere and fragrance of Kyoto. 8 & 6 tatami mats Hanare features a small kitchen & private bath and bathroom. Dine in the main house enjoying a garden view. Room Amenities: Wi-Fi / Air conditioning / Flat-screen TV / Yukata (Japanese robe) / Tabi-socks / Tanzen Haori (robe with light jacket, in winter) / Towels / Hairbrush / Razor / Shower cap / Body soap / Shampoo & Conditioner / Soap / Hair dryer / Toothbrush / Toner, Emulsion, Make up remover / Tea set / Iron (brought by request). All guests receive a unique traditional hachimaki towel with our special chrysanthemum crest. Enjoy relaxing coffee time at our Café Shinkokan after breakfast. Note that all prices are based on double occupancy. Guests traveling solo will still need to pay the full room rate for two people.